Mark Driscoll and plagiarism – Seattle megachurch pastor Mark Driscoll was accused of plagiarism by Janet Mefferd on her November 21 broadcast. Initially, she questioned Driscoll about using concepts and terms without proper citation. Jonathan Merritt at Religion News Service covered the story the next day. Given the nature of the evidence, I thought the matter might drop at that point. However, Mefferd dug deeper and found instances where it appears Driscoll took passages nearly verbatim from a commentary written by D. A. Carson. Merritt also has that story. Driscoll has his defenders but he also has some pretty persuasive critics, particularly this professor writing at First Things. I plan to look at this issue in more detail next week, but my initial thought is that the newer charges are more convincing and require some kind of response from Driscoll and his publisher. I’m surprised to see this known-to-be-false story posted here. It would be one thing to post it for the moral lesson aspect and say so in your comments, but it’s another to pass it along as if it were a true story without any such commentary. If you don’t realize that this story is just social media rumor, then how many other stories have you passed along that were also false? Consider this my goodbye notice. The response to the allegations against Driscoll remind me a bit of the uproar over Thomas Nelson pulling Barton’s book in August of 2012. Barton’s defenders came out in force to attack those who raised concerns. Some of that has happened already with Meffferd being the focus of attacks from those who support Driscoll. Michael Peroutka in Spanish River High School – I think this matter may get some attention next week. Michael Peroutka is a board member of the League of the South who spoke at a FL public high school on Tuesday. When his dba name Institute on the Constitution came to a school district in Springboro, OH, there was a major negative reaction among parents. I wonder if the same will occur in Boca Raton. Is the knockout game a myth? – Alan Noble at Christ and Pop Culture makes a pretty compelling case that the hysteria over an upsurge in racially motivated attacks by black mobs is unwarranted. In other news, ministers may not be able to take a housing allowance if a new court ruling holds up. I am very thankful to be celebrating my second Thanksgiving since my heart attack and surgery. Best wishes to all for a thankful day. With this caption — Church Members Mistreat Homeless Man in Church Unaware It Is Their Pastor in Disguise — David Barton’s Wallbuilders Facebook page posted the pretend story of a pastor who dressed as a homeless man in order to make a point to his church. The fictional story has been debunked by Snopes and Glenn Beck’s The Blaze. I can’t find any indication in the post that Barton realizes that the story is false. Once he realizes what he has done, he will probably say he knew it was a fiction story all along. However, of real interest to me is the discussion on the post. Multiple commenters have posted that the story is false and some are upset about it. In this discussion thread, one can see how people respond to finding out something that they thought was true is not really true. Some are disillusioned, some defend Barton, some say the accuracy doesn’t matter because it is a nice story and others indicate that truth and accuracy do matter when the story has been portrayed as true. Some seem to believe it anyway. Credibility is the issue. We’ve been around this block many times with Mr. Barton. Let’s see how he handles this one. That’s how the Daily Caller plugged my op-ed, What’s Behind David Barton’s War on Christian Colleges? Research demonstrates that, on balance, Christian colleges support the faith commitments of students. Why would David Barton say otherwise? Go read my Daily Caller piece on the subject. According to the young man in the video, the club wants to work more with IOTC. Here is a bit more about the IOTC plans at Spanish River. I suspect there will be some folks in the area who will not be excited about the prospects of IOTC in the high school. For more on IOTC click here. Spanish River Community High School was in the news back in February when the school principal stopped a presentation by Bradlee Dean, founder of You Can Run But You Can’t Hide. The same club — the American Club — was involved in that Dean was invited by the students in that club to speak at the school. According to World Net Daily, Dean was eventually allowed to give his speech after a letter from Liberty Counsel claiming discrimination was delivered to the school. Jake MacAulay used to work for You Can Run but now works for Michael Peroutka. For the last two weeks David Barton has been on the Andrew Wommack Show talking about Thanksgiving and the Pilgrims. There have been so many things worthy of a post but I just don’t have time. I asked the Barna Group and the Council for Christian Colleges and Universities about Barton’s claim that half of students at Christian colleges leave Christianity. Both organizations denied knowing about any such research. I did find this study summary which found that only 7% of Christian college students renounce their faith but that is all I can find. Steven Henderson’s study involved nearly 16,000 students and found that CCCU students, in particular, showed gains in religious commitment during their time at Christian college. I wonder if anyone will ever hold him accountable on these claims. Mr. Barton, if you have a source, could you please enlighten us? If we know the source, we can stop assuming you are making it up and then we can evaluate how credible or accurate it is. 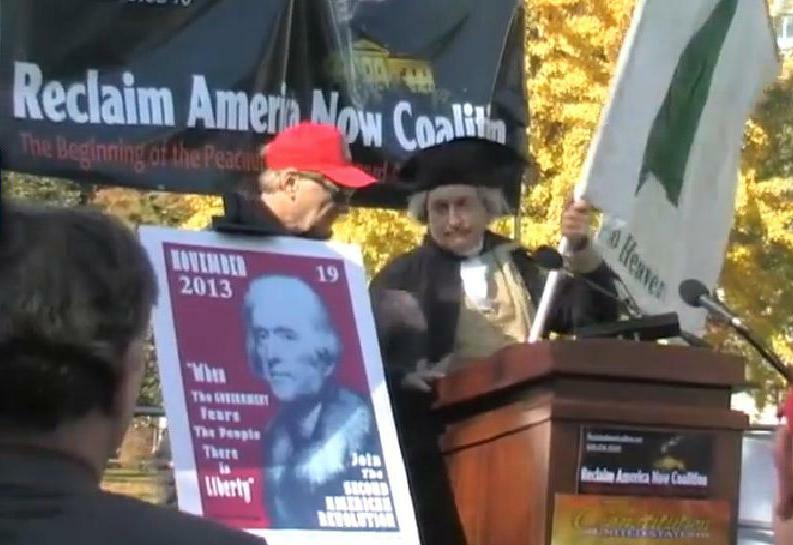 On November 19, Larry Klayman’s Reclaim America Now engaged in a “second American revolution” protest. The goal of the protest was to force Obama, Reid and Boehner out of office. Obviously, they didn’t succeed. While Jefferson’s name is not on the poster, it seems clear that they believe Jefferson was responsible for the quote. We have not found any evidence that Thomas Jefferson said or wrote, “When government fears the people, there is liberty. When the people fear the government, there is tyranny,” or any of its listed variations. Barnhill does not attribute the quote to anyone and the Monticello researchers were unable to find it in any of Jefferson’s writings. I don’t know, of course, if the false attribution is purposeful or due to ignorance. In either case, the organizers have misled their followers in order to whip up revolutionary sentiment. I hope Klayman’s rhetoric of revolution and false attribution of the founders doesn’t tip somebody over the edge. David Barton and WallBuilders have a long unwavering and proven record of unequivocal support for those in the Armed Forces, including their families, as well as military personnel and veterans suffering from PTSD. David not only has several children and family members serving in the military but we also regularly highlight numerous military heroes on our daily radio program and send out blasts in support of the military. Additionally, we actively raise money for groups who work to help heal our warriors, including those suffering from PTSD. Yet despite this unflagging support, Right Wing Watch, Huffington Post, and others from the liberal secularist left recently circulated a short clip, taken out of context from a long interview David did on a Veteran’s Day program stressing the importance of spiritual components in the treatment of PTSD. As a result of the inaccurate “reporting” of these so-called “news” outlets, many who saw those reports voiced concern to us over what they had been wrongly told. It is lamentable that while we support multiple approaches for PTSD treatments, the critics are so hostile to religion that they flatly dismiss possible spiritual solutions. Rest assured that we will continue our demonstrated record of support for using all available resources to assist those suffering from PTSD. And we will continue to work closely, as we have been, with top military and medical officials who on a daily basis treat these men and women who make so many sacrifices to preserve and protect the freedoms for the rest of us. We encourage you to watch the full program for yourself to see the entire context (link provided below)! So now the Southern Baptist Convention and Gospel Coalition are part of the “liberal secularist left” and “hostile to religion?” As has been a pattern, Mr. Barton does not regret what he said nor distance himself from Mr. Copeland, he blames the people who listened to the broadcast and reported exactly what the two men said. Freedom Watch and its founder Larry Klayman call upon all Tea Party, conservative, libertarian, and other groups and persons, indeed to all patriotic citizens, to converge on Washington D.C., en masse, on November 19, 2013, and demand the resignations of President Barack Hussein Obama, Senate Majority Leader Harry Reid, and House Speaker John Boehner. Klayman predicted millions would show up to demand Obama’s resignation. The highest attendance figure I have seen (Washington Times) is 200. Clearly Klayman didn’t meet his goal. In this clip, Peroutka says America was founded upon “the biblical view of law and government” and lauds Klayman for setting up the rally to reclaim that view. According to Time magazine report, Klayman is giving Obama until November 29 to vacate the office. If not, he will attempt to force him out. Our Institute On The Constituion Host Bill Flynn in Triad region of North Carolina announced his candidacy for the United States Senate race this past Sunday. Bill hosts a morning radio show on WEGO (980 AM). Bill has not only taught our U.S. Constitution course he was my co-host on the Constitutional Cruise, All Aboard America this past March. Bill is a good friend and patriot. The Institute on the Constitution is directed by Michael Peroutka, a board member of the neo-Confederate and secessionist group the League of the South. The League has been toxic to at least one sitting Senator (Rand Paul) and may be for Flynn as well. The IOTC displays website articles which defends racial discrimination, promotes a justification for slavery, savages Abraham Lincoln, and claims that the Confederacy was in the right. The GOP field is crowded with Flynn being a later entry so it is unclear if he will get much traction.